Enter beneficiary ID and click on “Generate OTP". An OTP (One Time Password) will be sent on registered mobile no. of the beneficiary or to the main card holder’s mobile if that is the only registered number. Enter OTP and click on "Proceed". Beneficiary details are displayed on screen. Click on “Proceed” button if the details displayed on screen are correct otherwise click on “NOT YOU”. In that case login again and proceed as above. Select Specialty, Dispensary, Doctor as per your choice and click on “Proceed” button. 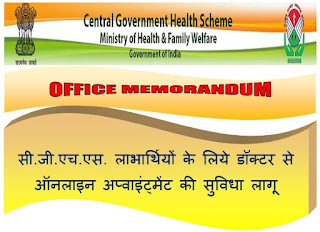 A beneficiary can select a GDMO (General Duty Medical Officer) or a Specialist of any of the CGHS wellness centre for appointment. A calendar is displayed to choose a date that has the availability of appointment for the selected doctor. Select date for appointment. On selecting date, top of the screen shows the slot timings and the appointments available. A beneficiary can choose the desired slot. Click on “Proceed to Book Appointment”. One can go back and make changes by using the ‘Change the Specialty’ button. 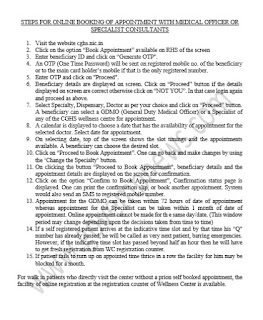 On clicking the button “Proceed to Book Appointment", beneficiary details and the appointment details are displayed on the screen for confirmation. 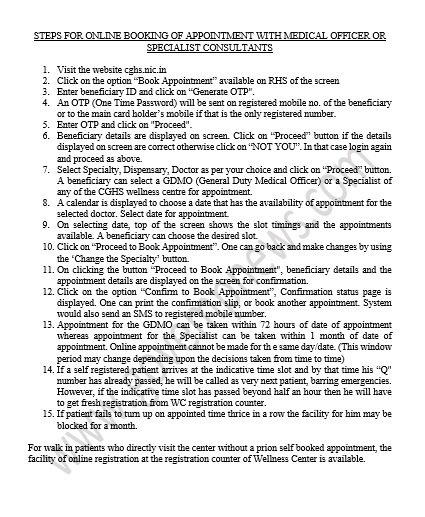 Click on the option “Confirm to Book Appointment”, Confirmation status page is displayed. One can print the confirmation slip, or book another appointment. System would also send an SMS to registered mobile number. If a self registered patient arrives at the indicative time slot and by that time his “Q" number has already passed, he will be called as very next patient, barring emergencies. However, if the indicative time slot has passed beyond half an hour then he will have to get fresh registration from WC registration counter. If patient fails to turn up on appointed time thrice in a row the facility for him may be blocked for a month. 3. AD MSD Udyan Marg, New Delhi. 6. 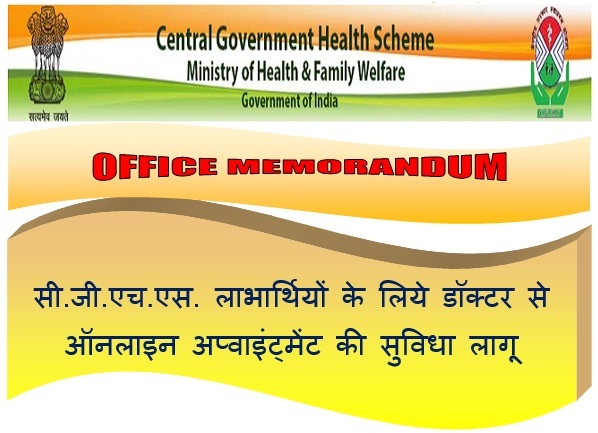 PS to Director CGHS Nirman Bhawan New Delhi.